This spacious unique space has a modern feel with numerous welcoming windows which allow plenty of natural light into the venue, creating a luminous ambience. The creative interiors of colorful walls and polished concrete floors make this venue trendy. 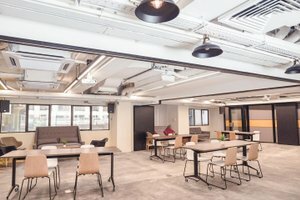 Boasting different amenities including air-conditioning, electricity, Wi-Fi, washrooms, just to mention a few, the space is a perfect place to host events and pop-up stores. 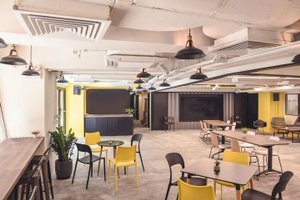 The space also comes with an inviting outdoor terrace making it best for brands and corporate parties to connect with different people. 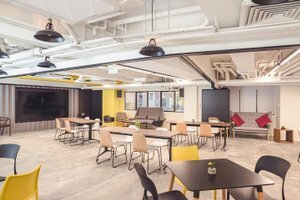 This fashionable space is strategically situated in the business area of Wan Chai. It is an amazing space to host a private event, private sale and pop-up store. This space can be rented on an hourly basis, please make a request for details.